Garritan Personal Orchestra is state-of-the-art software that reproduces sounds of the musical instruments in a symphony orchestra directly from your computer. The award-winning Personal Orchestra has set the standard for orchestral sample libraries. More than 150 orchestral instruments-lush strings, intimate woodwinds, joyous brass, powerful percussion, a Steinway virtual concert piano, Stradivari violin, a glorious concert organ, heavenly harps, select Program SAM brass, and more. The entire orchestral collection is integrated with the ARIA Instrument Player and works as a virtual instrument. No need to purchase a separate sampler. Garritan Personal Orchestra provides multiple individual instruments from which you can build your own ensembles and orchestras. Construct solos, duos, trios, quartets, chamber groups, sections, or a full symphony orchestra-the way you want. Garritan Personal Orchestra allows you to express your musical ideas quickly and easily. Just load your instruments and play. Standardized controls allow you to become familiar with the library quickly and master all the instruments. Garritan Personal Orchestra supports all popular formats, Mac and PC, as a standalone program or as a plugin (VST, RTAS, and OS X Audio Units), works with supported notation programs, and works in 64-bit operating systems. More than 150 orchestral instruments-lush strings, intimate woodwinds, joyous brass, powerful percussion, a Steinway virtual concert piano, Stradivari violin, a glorious concert organ, heavenly harps, select Program SAM brass, and more. Your instant orchestra-just add imagination! Orchestration has never been so easy! 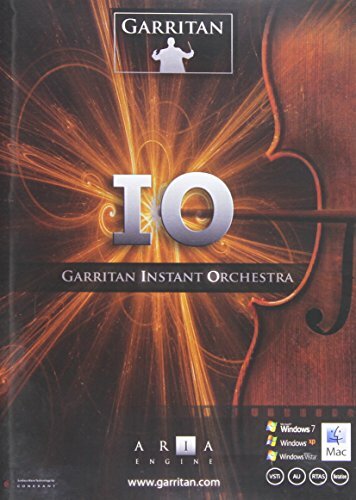 Garritan Instant Orchestra is a must-have library that offers an easy way to make super-quick orchestrations in minutes-from start to finish. Includes amazing orchestral instrument combinations and effects, bombastic brass, ultra-lush strings, low-octave rumblings, spooky wind textures, mega-hits, wild overlays, slivery choirs, light glissy harps, ethereal textures, chaotic whirls, rises, glissandi, chord clusters, and much more. The premise of Instant Orchestra is to make orchestrating easy. Instead of having to create scores on staff at a time, nearly any musician can complete full, rich orchestrations with just a few staves or tracks of music. You can go from small to massive orchestrations very easily, with little loading and instant results. Garritan Instant Orchestra carefully mixes orchestral instruments from various instrument families-playing in unison, in octaves, and tutti. These orchestral combinations range from light, delicate sounds to big, epic patches, all of which can fill out any orchestral gaps in your music. Immediacy drives the entire product. Also included are many special orchestral effects that you often hear in movies. These effects consist of glissandos, rips, clusters, harmonics, instruments playing in non-traditional ways, and a variety of techniques. These types of effects are vital to film and game composers. The entire Garritan Instant Orchestra library is integrated into the ARIA Player and there is no need to purchase a separate sample player. Garritan Instant Orchestra also features the Conexant® Endless Wave™ technology for hard disk streaming of multiple combinations for large orchestrations. Supports all popular formats, Mac and PC, as a standalone program or as a plugin (VST, RTAS, and OS X Audio Units), and works with supported notation programs such as Finale. Your instant orchestra-just add imagination! Includes bombastic brass, ultra-lush strings, low-octave rumblings, spooky wind textures, mega-hits, wild overlays, slivery choirs, light glissy harps, ethereal textures, chaotic whirls, rises, glissandi, chord clusters, and much more.